“I’d decided I was going to buy a new excavator for my start-up but most sales people didn’t even get back to me with a quote,” Ben, now 32, with several machines in his fast-growing company, said. Ben’s employer of seven years, Cooke and Dowsett, one of the country’s largest plumbing solutions companies also helped, putting contract jobs his way around his home town of Ballarat, even though they were losing his skills in-house. The pay back has been huge. In three years Ben and his wife and business partner Rachael have bought four machines – all of them Komatsu, employed six people full time and developed a close-held group of key customers with whom they have a strong working relationship. 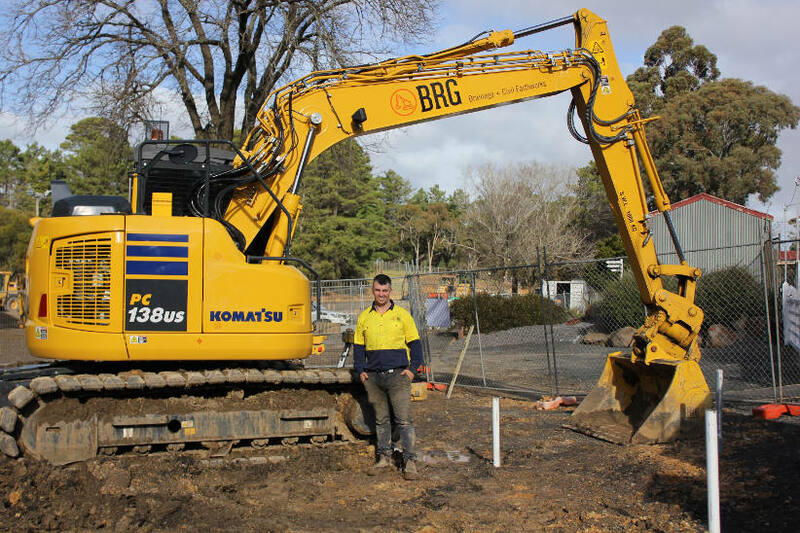 Their business, BRG, an amalgam of their initials, now owns two Komatsu PC 138s and a PC 228 all of them bought new and a PC55 for intricate jobs, along with a Kenworth prime mover and a tri-axle float. It’s a huge leap of faith when you’re the parents of two pre-school daughters to leave your job and sell your house to raise working capital. “I was always going to back myself to have a go and you learn quickly when it’s your own money involved,” Ben said. Their success story could fill a text book for young entrepreneurs. “I wanted to buy new machinery because I couldn’t take the risk of owning something that could break down or lose value in those first few years,” Ben said. His first PC138US-8 ticked the boxes. “A thirteen tonner was the right machine for the variety of work I wanted and buying it new provided me with certainty, even free service for the first 2,000 hours,” Ben said. Now he has a small fleet of Komatsus supported by the company’s suite of customer aids including Komtrax which has already prevented one theft and which provides him with valuable operating information on his machines. Ben hires people and buys his machines with equal caution. “I need to have more business than I can handle before I do either,” he said. “I buy the machine first, but I don’t do that until I know the job is secure, and then I work doubly hard on it myself before I hire an operator. Ben’s philosophy is to employ top operators rather than use contractors, and to buy machines rather than rent them. “Renting costs, your money and profit,” he said. “It’s hard to get good people when you start up but as you put together a fleet of good machines and a list of good clients you can build a team around you. How big do they want to grow? “My accountant introduced me to the concept of finders-minders-and-grinders,” Ben said. “The finders bring in the work, the minders plan and supervise it, and the grinders do it.